For many generations of audiences, their first taste of science and the wonders of the universe were through Carl Sagan’s acclaimed 1980 documentary series ‘Cosmos’. With Sagan as narrator and storyteller, the thirteen-episode series from PBS covers the vast knowledge of the universe known at the time, presented in an easily digestible manner. It’s still one of the most-watched documentary series ever made, nearly forty years later, but how relevant could it still be many decades later? Is there any value in the series when science has made enormous advances that render much of its content irrelevant? What you’re left with though is a chance to appreciate the artistry of the series. I’ve always been fascinated by astronomy, but until reviewing this world premiere release from Via Vision, I’d never seen Sagan’s series, and I was immediately struck by how incredibly arresting and beautifully made ‘Cosmos’ is. Sagan and co-writers Ann Druyan and Steven Soter fill each episode with an extraordinary amount of detail, but each chapter is crafted with an astute awareness of its audience. It neither talks down to its audience nor assumes past knowledge or interest, but balances beautifully between the two by using what would have been advanced television technology at the time, all of which surprisingly still holds up now. For a dense science documentary, ‘Cosmos’ is shockingly entertaining, and almost all of this is down to Sagan himself. His is the only voice we ever hear in the series, but his love for the science and his enthusiasm to share that love with his audience is infectious. Sagan is a storyteller, and the story he has to tell us is the greatest story of them all, one of alien worlds both in space and inside our bodies, of scientific heroes and villains, of life and death on a grand scale, of wonder and mystery and the great unknown, and fundamentally the search for the key to our existence. That’s enormous stuff for an audience to comprehend, but with Sagan holding our hand, he leads us through it like the best museum tour guide you could possibly want. The series is subtitled ‘A Personal Journey’, and the fact that this series is so personal to Sagan is what makes it so enthralling to watch decades later. It’s also a beautifully made, almost elegant series. Using rough animation, documentary footage and scientific imagery, much of which audiences in 1980 would never have seen before, the series constructs a vivid visual tapestry to complement Sagan’s narration. Again, it doesn’t sacrifice scientific accuracy for a presumed lack of intelligence in its audience, but finds ways to present the material in visually interesting and playful ways. The series also makes use of reenactments when discussing important historical figures, but it does so in a manner that’s never corny or distracting. Sagan is a storyteller, and the story he has to tell us is the greatest story of them all, one of alien worlds both in space and inside our bodies, of life and death on a grand scale, of wonder and mystery and the great unknown, and the search for the key to our existence. The science may not be as accurate or up-to-date as it was, but ‘Cosmos’ is such an expertly constructed piece of television that it doesn’t seem to matter. It still has the power to dazzle and amaze, and it’s clear to see the influence it has had on documentary television since its first broadcast. It’s still as immediate, vital and enthralling as when it was made, and is now beautifully complemented by the 2014 follow-up with Neil deGrasse Tyson which takes the principles of Sagan’s vision and updates them for the 21st century. There aren't many documentary series that you could call iconic, but ‘Cosmos’ certainly deserves a place amongst the great moments in television history. Because ‘Cosmos’ was mostly shot on video as opposed to film, high definition restoration was always going to be difficult. Using the 2005 Special Edition video masters, the series has been up-converted from standard definition into a 1080i 1.33:1 transfer and further work has been done to improve the image. Considering the limitations of the source and its age, the series looks pretty great, often quite beautiful, on Blu-ray, with extra care taken to improve clarity and image stability. The transfer certainly celebrates the visual richness of the series, and while there are inevitable glitches in the image that come with using a video master, I doubt it has ever looked better. The series is also complemented by a strong and clear Dolby Digital 5.1 track. Again, there are obvious limitations in terms of audio from a 80s TV series, but this surround remaster has done a really terrific job. For its Blu-ray premiere, ‘Cosmos’ looks and sounds better than you could have hoped for. 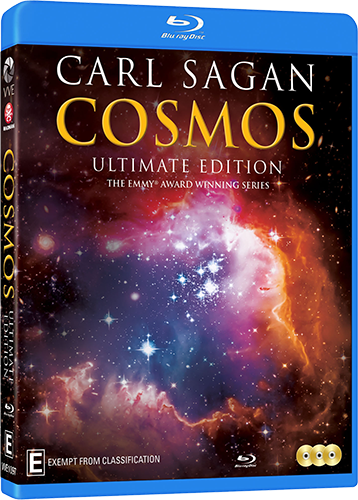 By using the 2005 Special Edition as the basis for this Blu-ray release, selected episodes come with short scientific updates from Sagan, many of which were already out-of-date by 2005. The first episode also comes with an introduction from Ann Druyan. The 'Cosmos: Ultimate Edition' competition has now closed. Winners will be announced shortly. Competition opens at 5pm AEST on Sunday 16th April 2017 and closes at 11:59pm AEST on Sunday 23rd April 2017. Five winners will be chosen at random on Monday 24th April 2017. To successfully win, entrants must fulfil the above entry conditions before the time the competition closes. Current members/followers are eligible to enter the competition. Only one entry per person. Only one winner per household. To be a valid winner, the entrant must not have won a prize from SWITCH within the last 28 days. Each winner will receive one Blu-ray copy of 'Cosmos: Ultimate Edition'. By entering, you agree to receive occasional emails from SWITCH in the future. If you decide to unsubscribe from these updates, any further entries will not be applicable. Only Australian residents are eligible to enter. 'Cosmos: Ultimate Edition' is available on Blu-ray and DVD on Wednesday the 19th April 2017 from Via Vision Entertainment.